Chef Nguyen Tin Truong Huy - Chairman of the young cook club shared how to make summer rolls by North - Central - South styles: Shrimp meat skin roll, roast pork sour shrimp; Hue roast meat…; after summer roll was considered as one of top 50 delicious in the world. 200g sugpo prawns; 100g fat and lean meat; 50g skin of pork; 50g skin of meat; 20g rice flour, 100g fresh rice vermicelli; 50g herbs or cinnamons; 50g salads; 50g shallot leaves; 8 girdle cakes ( which has 20cm of diameter); a coffee spoon of chutnee; mince garlic; mince lemongrass; 4 spoons of fish sauce; 2,5 spoons of sugar; 6 spoons of coconut milk; 1,5 spoons of vinegar. If you want to make the sauce, prepare 2,5 spoons of glutinous rice; 4 spoons of grind pork liver. Make prawn and pork and do them with coconut milk to a turn, then fish them out and let them get cold. After that, slice the port and split prawns in half lengthwise back. Mix rice flour skin: Mix pork skin, meat skin, mince garlic, rice flour well. Roll: Dip girdle cakes in water cursorily then spread each cake on each plate. 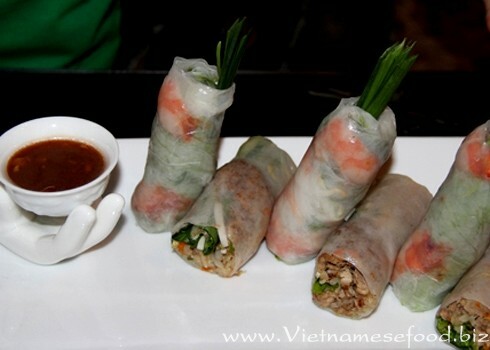 After that, roll a mix of prawn, met, rice noodle, salad, shallot leaf and herbs with the suitable length and size. This dish is used with the sauce. How to make fish sauce: Put fish sauce, sugar, coconut milk, vinagar in a pan and cook for smelt then let it get cold. After that, add pepper, mince garlic (you can add sour). Or you can use sauce instead of fish sauce. Here’s how to make sauce: Put chutnee, mince pepper, garlic, lemongrass, glutinous rice, grind pork liver in a pan then poil them. 200g pig ear, 100g fresh rice noodles, 50g herbs or cinnamons, 50g salads, 50g shallot leaves, 8 girdle cakes (which has 20cm of diameter), 2 spoons of “mắm nêm” (made from small fish or crab), 1 spoon of mince pineapple, 2 coffee spoons of sugar, 1/6 spoons of MSG,1/2 spoons of fish sauce, 1/5 spoons of coconut milk. Wash pig’s ear, boil it then get it cold and slice it. 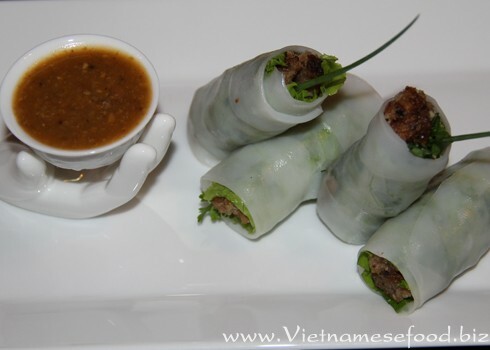 After that, use soft girdle cake to roll it with herbs, salads, shallot leaves…Use this dish with “mắm nêm”. How to make sauce: "Mắm nêm", mince pineapple, sugar, MSG, fish sauce, coconut milk. Put this mix in a bowl, stir them and sprinkle mince pepper then try it for your taste. 5 steamed thin rice pancakes, 50g sour shrimp (prepared), 100g shaven spinach, 50g cut herbs, 40g batatas, 100g pork, some kinds of spice: onions, garlics, lemongrass, pepper, powdered red pepper, each one a little. Slice the pork. Cut batatas into yarns and boil them. Spread steamed thin rice pancake on a plate, add spinach, herb, batata then roll it. Cut the roll into small pieces. 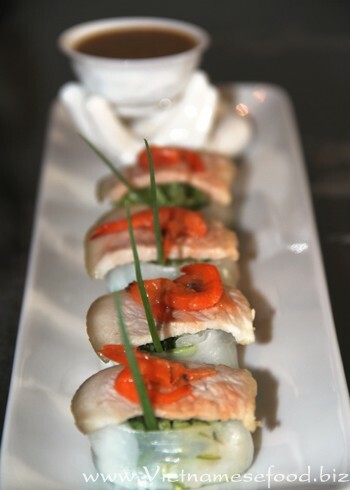 Finally, put pork and sour shrimp on the surface of the roll. How to mix the sauce: Put lemongrass, minced garlic, onion, minced pepper, meat and grind pork liver on a pot and poil them. Then add powdered red pepper, poil it then taste it. 200g porks, 200g herbs in different kinds, 500g salad, 5 steamed thin rice pancakes, lemongrasses, pepper each one a little. Slice pork then mix with spices, lemongrass, pepper then grill over a red fire. 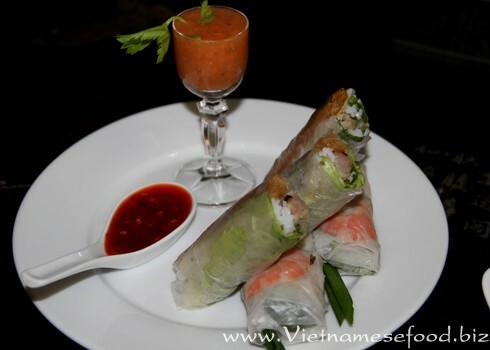 Use steamed thin rice pancake to roll all of these ingredients with the suitable size.This dish is used with the same sauce as sauce of roast pork sour shrimp roll. 100g hams, 50g shrimps, fat porks, 100g herb in different kinds, 100g star fruits, 50g green bananas, 8 rice papers, 100g powdered red peppers, 100g sinews and grinded meat, 20g minced lemongrasses, 20g onions,, 50g glutinous rice, 4 spoons of coconut milk, shrimp color, 30g roasted sesames, 30g peanuts. Use rice pancake to roll each shrimp then fry them until it’s bold and crispy. Spice hams, shrimps, fat meat then grind them. 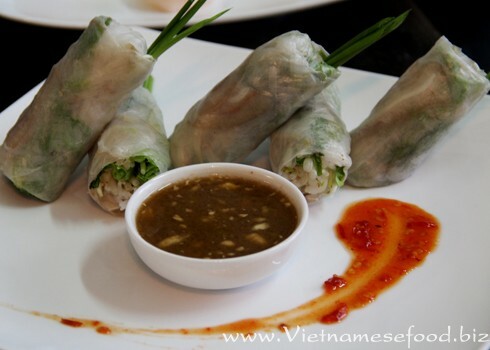 After that, knead this mix into “chả” bundled around a bamboo stick then grill to a turn. Slice star fruit, green banana. Finally, use soft girdle cake roll all of these ingredients. How to make sauce: Take powdered red pepper, sinew and grinded meat, minced lemongrasses, onions, glutinous rice, coconut milk, shrimp color, roasted sesames, peanuts to a pan and poil it then taste it. This dish can be used with sauce. Here’s how to make sauce: Take 100g green peppers, 50g bold sugar, 30g minced garlic, 2 spoons of water to a pot and poil it until it’s thick.